My name is Jo, I live in Dorset, England. 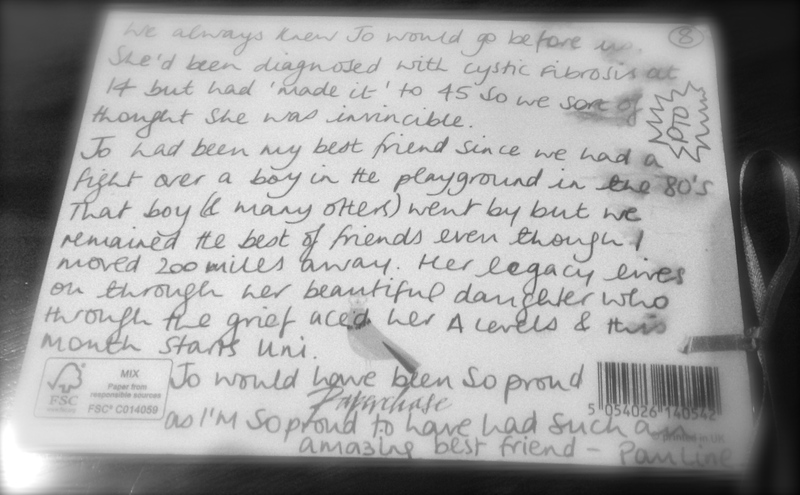 I’ve written this card in memory of my brother John who sadly lost his battle with cancer 7 years ago, age 56. 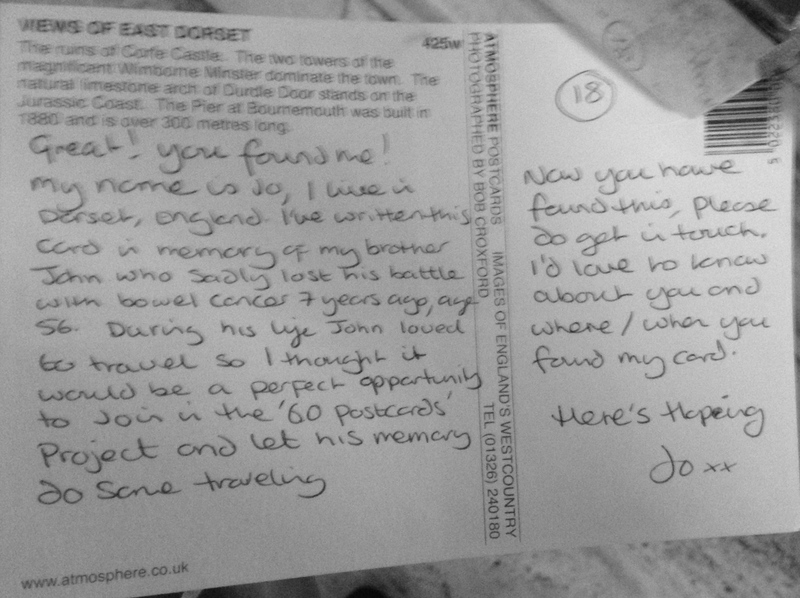 During his life John loved to travel so I thought it would be a perfect opportunity to join the ’60 Postcards’ Project and let his memory do some traveling. Now you have found this, please do get in touch. I’d love to know about you and were/when you found my card. “We always knew Jo would go before us. She’d been diagnosed with cystic fibrosis at 14 but ‘made it’ to 45 so we sort of thought she was invincible. Jo had been my best friend since we had a fight over a boy in the playground in the 80’s. That boy (& many others) went by but we remained the best of friends even though I moved 200 miles away. Her legacy lives on through her beautiful daughter who through the grief aced her A Levels & this month starts uni. “To whoever finds this postcard – local or traveller, I send you positive energy from London, UK. I am writing this to spread the memory of my mother – Linda who passed away in 2003. 3 months before this we took a trip to NYC having the trip of our lives. It remains a very special place to me due to these memories of happy times. My mum wanted to travel and see the world a great deal more than she had the chance to. I’m lucky enough to travel monthly with work and take her memory with me. Most recently to Greece – as on the front of this card. Please don’t throw me away but take a few minutes to read. This card is in memory of my mother, Rose, who loved New York. Sadly I never really knew her. She gave birth to me in Dublin in 1953 when she was just 17. She looked after me for 18 months but in May 1955 gave me up for adoption. I was adopted and went to live in England. She then set off on the boat for New York, where she worked hard and made many friends. It wasn’t until 1987 when I decided to trace her that I found she had been taken ill in 1974, returned to Ireland and died aged only 39. I met her sisters and brother and heard who an amazing, loving and lovely person she was. I don’t know if it’s genetic but my daughter loves New York and would love to live and work there. Not a day goes by without me thinking of Rose and I’m sure that between 1955 and 1974, while living in New York, not a day would have gone by without her thinking of me and praying that life worked out OK. I can let her know now that it did. Thank you again to Jo, Pauline, Lucy and Tony for sharing your words and memories. I look forward to posting more of the NYC postcards in the coming weeks along with other articles from readers. If you have created a tribute in memory of someone or would like a platform to share your story, then please email me on 60postcards@gmail.com. Come join the collective.